A few weeks ago I noticed that Australian’s leading reggae producer Mista Savona posted a link to Blue King Brown and The Congos’ Babylon a Fall. I didn’t know anything about Blue King Brown, but Mista Savona and The Congos sounded like a nice combination, so I listened to the tune, a tune featured on Blue King Brown’s third album Born Free. When I listened to the tune and the album I was completely blown away. Some of the beat-driven tracks were absolutely stunning. It turned out that Blue King Brown is an eleven piece outfit fronted by the energetic Natalie Pa’apa’a and one of Australia’s premier live bands with a strong following around the world. They have over the years shared stages with a diverse range of artists, including Damian Marley, Santana, Julian Marley and Lauryn Hill. Blue King Brown dropped their debut EP almost ten years ago and they are known for powerhouse and percussion-driven riddims. Their approach is a punky one and Natalie Pa’apa’a’s vocal style is rebellious and confident. One Born Free they have collaborated with a variety of different producers – Mista Savona, the Grammy Award winning James Caruso, Styalz Fuego and Chris Macro. And the result is a powerful sonic experience. Some of the highlights are downright militant. For example the dark Like a Lion and the pounding Renegade. Then there’s the anthemic All Nations – with a catchy break in the end – and the powerful Jesse Royal combination Righteous Ones. But there are also a number of slower and smoother jams, particularly One People and Educate the Masses. Both acoustic and earnest. Internet is fascinating. 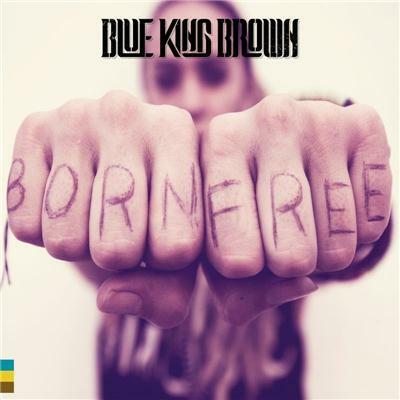 Two weeks ago I had no clue about Blue King Brown or Born Free. Now I have yet another contender for the best albums of 2014 list.